New upper mount with split and bolt to make changing bushings easier. in our rear end bracket section. New adjustable trailing arm end that fits stock bushing. Available in both left and right hand 3/4-16 thread. Will also fit poly or our spherical bushings. Available in our trailing arm section. Our A frames are now available with spherical bearings for smoother operation. We also increased the ball joint plate to 1/4" during 2016. We have seen some ball joints bolted to the underside of the ball joint plate, this puts extra stress on the plate by moving the ball joint center line below the A frame center line. The problem is worse for the rebuildable ball joints as their center line is even farther below the plate. We recommend installing the ball joint through the A frame and possibly even spacing it up to get the center lines closer. Remember the roll center is determined by a line drawn through the ball joint and shaft, not the angle of the A frame itself. We Have been getting a lot of requests for a longer left side trailing arm bracket for metric cars. We have now available one with 5 holes, with the top hole 1 inch lower than stock and the bottom hole 7 1/2 inches below the bottom of the tube to center of hole. The holes are 1 inch spacing. We had to make the clamp tube an extra 1/2 inch wider (now 3 1/2 wide) and used 1/2 inch bolts to handle the extra stress from the longer bracket. We also welded in a reinforcing plate between the plates on the back side for further strength. The part number is 906505XL and they are $85. We are seeing a demand for more Imp/Caprice parts as the G body cars become harder to find. 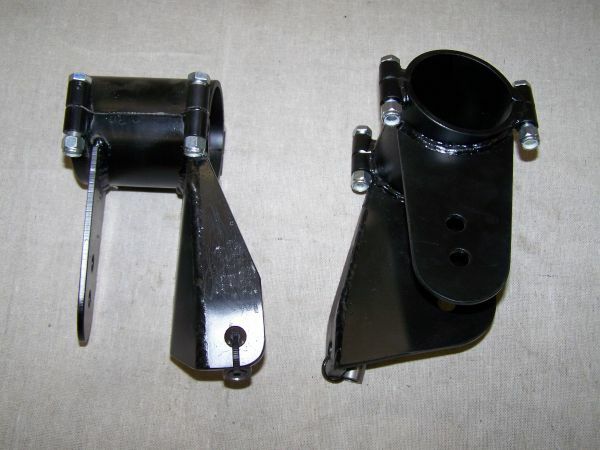 Our clamp on trailing arm brackets make mounting a rear end much easier. They have 3 trailing arm positions and the clamps are 4" wide and fit 3" tubes.